The Tibetan Buddhist nuns of Khachoe Ghakyil Nunnery in Kathmandu, Nepal, will present Womens Freedom and Spiritual Liberation: An Evening of Sacred Performance in cities across Germany and elsewhere in Europe this autumn. 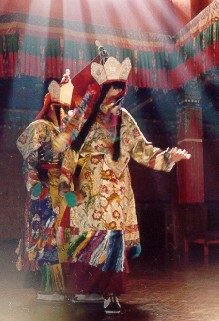 The European tour of the nuns of Khachoe Ghakyil Nunnery (KGN) marks one of the first times that a troupe of Tibetan nuns have gone on tour in the West to stage performances of sacred music, dance, theatre and debate, and to introduce audiences to the central role women have played in the spiritual life of Tibet. The spirit of Tibet, the "land of snows", comes vividly to live as the eleven nuns perform colourful masked dances and vibrant harmonic chants. 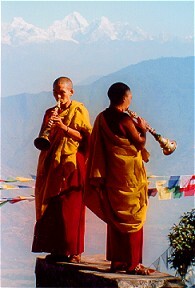 In counterpoint to these ancient rituals, the nuns illustrate the innovative nature of their tour with a demonstration of formalized philosophical debate and religious practice that was previously unavailable to women; and with the world premiere of an original sacred dance dramatizing the Life of Milarepa, the most famous spiritual biography in Tibet. Nuns travelling the world on a fund-raising tour, practising debate, performing ritual masked dance, and drawing sand mandalas have never been seen before in the West, because they represent the breakthrough of Tibetan women to an unprecedented status in the spiritual life of Tibetan culture  a new, egalitarian culture that is emerging in the Tibetan refugee communities of India and Nepal. But two of the performances by the KGN nuns highlight the fact that even in the days of medieval, patriarchal Tibet, the feminine powers of the natural world, and the individual powers of great women practitioners, have always been recognized and revered. The Practice of Ch�d is a ritual that was traditionally performed by the famous female saint Machig Lapdr�n in the eleventh century. While the KGN nuns intone haunting melodies to the accompaniment of drums and horns made of bone, this ritual symbolizes the death of the ego, as it images the offering of ones own dead body to fearful demons. As one Tibetan master put it, "the Practice of Ch�d ruthlessly severs self-centered arrogance through an understanding of the sameness of oneself and others." Later generations considered the female saint Machig Lapdr�n to be a dakini, a "Sky-Dancer," a dynamic, dancing, female emanation of enlightened mind. 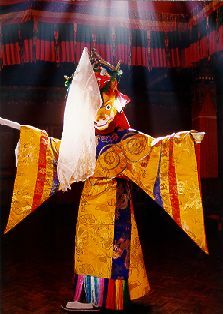 In The Dance of the Dakinis, the KGN nuns perform a twirling ritual of homage and praise to the divine feminine principle symbolized in the Sky-Dancers of Tibetan Buddhism. This is a perfectly appropriate dance for these nuns, since the name of their convent, Khachoe Ghakyil, literally means "The Bliss-Whirl of the Sky-Dancers." The program will be narrated by one of the founders of Khachoe Ghakyil Nunnery, Ven. 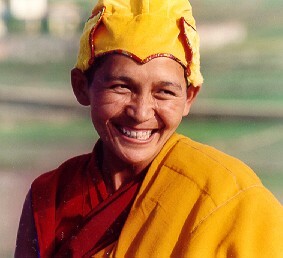 Thubten Dekyong, a Tibetan Buddhist nun who has translated all over the world for many great lamas; and she is highly regarded as a teacher in her own right. But nothing is closer to her heart than Khachoe Ghakyil Nunnery, a place she helped to build from the ground up, and which provides both refuge and opportunity for Tibetan women to pursue their spiritual path without limitation. Joining her will be ten nuns who were specially selected for their talents in the ritual arts, and all of whom are undertaking their first travels away from the Himalayan mountains ... the Venerables Tenzin Tsepel, Losang Palmo, Tenzin Choden, Ngawang Palmo, Tenzin Jangsem, Tenzin Khachoe, Thubtan Dolkar, Ngawang Choezom, Thubtan Choezom, and Jangchub Gyalmo. These young women (aged 20-35) are members of the first generation of nuns to be fully educated in the monastic curriculum which their brother monks have enjoyed for centuries. 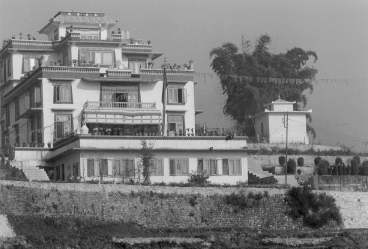 Khachoe Ghakyil Nunnery in Kathmandu is one of a new generation of nunneries established in exile. It was founded in 1986, under the direction of Lama Thubten Zopa Rinpoche, part of the worldwide Buddhist network the Foundation for the Preservation of the Mahayana Tradition (FPMT). The nuns of KGN have had the doors of a classical Buddhist education opened to them in a way that was unheard of in old Tibet. Not surprisingly, once given access to scholastic training, Tibetan nuns have shown an intense determination to excel in their studies. 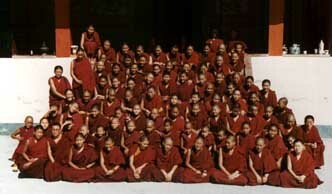 In fact, there is a legend that centuries ago Tibetan nuns were educated in philosophy and debate. But one day a brilliant young nun defeated a famous scholar in the debate courtyard of his own monastery. Soon there came down an edict: henceforth nuns were not to be trained in debate! This story may be apocryphal, but the current suppression of religious freedom inside Tibet has caused hundreds of nuns to flee Tibet in recent years. This influx of nuns seeking religious freedom has brought a rapid increase in the population of the nunnery from the original five nuns to the current count of two hundred and twenty. A primary reason for their European tour is to raise funds so that facilities can be expanded to meet the ever-increasing needs of these new arrivals, and so that the nunnery can become truly self-sufficient. Hosted by Women Active in Buddhism.